Power take-offs (PTOs) are mechanical gearboxes that attach to apertures provided on truck transmissions and are used to transfer the power of the vehicle engine to auxiliary components, most commonly a hydraulic pump. The hydraulic flow generated by the pump is then directed to cylinders and/or hydraulic motors to perform work – think dump trucks, refuse collection trucks and wreckers. In some PTO applications such as pneumatic blowers, vacuum pumps and liquid transfer pumps, the PTO provides power, in the form of a rotating shaft, directly to the driven component. The transmissions commonly found in Class 4 and larger vehicles will have provisions for the mounting of a PTO. Generally there are two apertures, one on each side of the transmission. When discussing aperture location one refers to the passenger side of the truck as the right and the driver’s side as the left. The power take-off may be engaged by means of a cable, air pressure or hydraulic pressure. Various output shaft configurations are available to allow for a driveshaft connection or the attachment of hydraulic pumps directly to the PTO without an intermediate shaft. The Society of Automotive Engineers (S.A.E.) has established standard mounting face dimensions for hydraulic pumps, which PTOs are made to accept. The S.A.E. type B mounting is the most common. The transmission’s PTO aperture may be of the six-bolt, eight-bolt or ten-bolt type, referring to the number of fasteners used to attach the PTO to the transmission. Six- and eight-bolt openings are S.A.E. standard sizes as found on manual and automated manual transmissions. The ten-bolt opening is exclusive to Allison automatic transmissions. Power take-off input gears mesh with the transmission’s PTO drive gear and transmit power to the PTO output shaft. 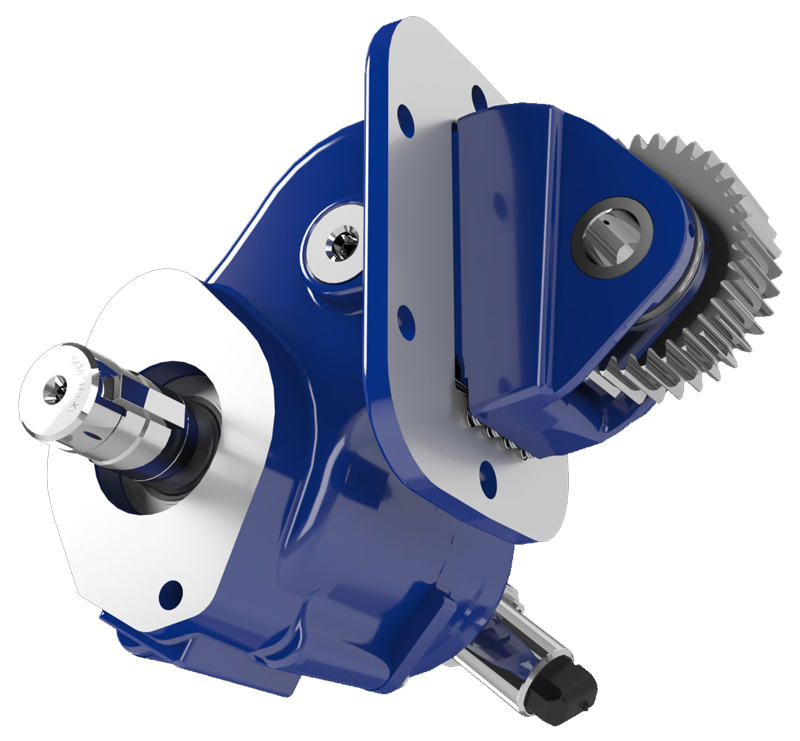 Muncie Power Products works closely with truck transmission manufacturers to ensure that the PTO gear matches the mounting depth, pitch and helix angle of the transmission gear. Power take-off output shaft speed is dependent upon truck engine speed, transmission gearing and the internal gear ratio of the PTO. To simplify selection, Muncie Power calculates the transmission data and catalogs PTOs according to their output shaft speed in relation to the truck engine. In the Muncie Power Products PTO Quick Reference Catalog and online application aids, one will see PTO speed expressed as a percentage of engine speed. One can therefore determine the PTO speed in revolutions per minute (RPM) by multiplying the engine speed by the PTO percentage. All PTO driven components have an operating speed range, and the power take-off is selected that will properly match the desired engine operating speed to the required component input speed. This can be determined by referring to the written specifications of the driven component or consulting with one’s PTO supplier.